Good morning. To start the day, I've got a pretty song from a beautiful singer: 'I'm Gone' by Tamaryn. She's New Zealandish (is that right?) born and bred, but moved to San Fransisco at some point to pursue the rosy path of music. It's not a bad life at all is it? Maybe that's why her music is so ear-friendly. Easy-listening. But not in a picture book kind of way. More in a grand impressionist painting kind of way. You just know from first look, first listen, that it's a pulchritudinous thing. I think that's a good way to describe this song. It's actually a kind of sound that isn't insanely happy, it's more sadly content than that. It reminds me of an overcast day by the sea, the wind blustering along the dirt-coloured beach and the sea with its shade of dark teal and brown whipping its washes in the near-distance. You walking along in a raincoat and hair tangling around your face, hoping for a sunny day at the beach but preparing for the dismal seaside experience. Perhaps this is just because I am used to a day by the sea anywhere in the UK. It's kind of beautiful in a disappointing way, isn't it? Not like this song. It's beautiful in a pretty way. But judging from the title, it's supposed to sound like a grey day at the beach. 1-0 me. I totally dig the lazy laid-back psychedelic effects on the guitars and the lo-fi, 80s-esque drums. All of it pours over you like a stream of liquid nitrogen, chillingly hypnotic with its distorted sounds and Tamaryn's voice, purring and crooning in the midst of the clashing guitars. The track is a chasm of absence and loneliness out of which this blissfully aching dreampop sound erupts. 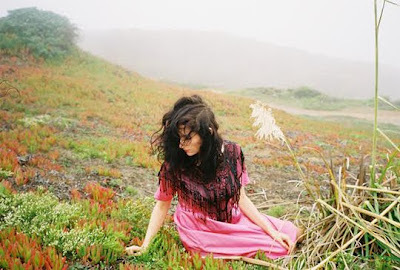 It comes from her upcoming second album Tender New Signs, due for release on 16th October on Mexican Summer records. She's collaborated on this on with longtime collaborater-producer Rex John Shelverton. And if it's all like this, I'll be looking forward to it. • Follow Tamaryn on Twitter!